No matching products were found with specified style number. where <Style Number> is three-digit model number with leading zeroes. If you would like to speak to a customer relations representative, please call us at 800 2223 7610, Monday through Friday from 9-6 pm East Standard Time.We want to serve you! Are purchases subject to taxes? We ship to most places around the world. Our base shipping rates for domestic and international orders are below. The total shipping expenses will depend on the dimensions and weight of the package and will be displayed at checkout. Shipping charges do not include international taxes or duties. You may want to contact the customs office in the destination country for information about applicable duties or taxes. If an order is placed on fbeyewear.com and then refused by you, the original shipping costs (as well as any duties, taxes and/or customs charges that were incurred in shipping the package) will be subtracted from your merchandise refund. fbeyewear.com makes every effort to minimize our international shipping charges. We are required by law to disclose the full value of the package contents and cannot alter this value. If you have any shipping questions, please Contact us. Each address you instruct us to ship to, including gift-recipient addresses, is considered a separate order and is subject to applicable shipping charges.Delivery schedules are estimated. Actual delivery times may vary depending on shipping locations. The order will ship the same day or the following business day if you place it Monday through Friday by 5pm Eastern Standard Time. For orders placed on the weekend, we ship on the first business day after that weekend. For orders placed after 5pm, we ship on the following business day. Transit times vary on the ship method you select at checkout. International orders may be held in customs for 3-5 days. You will receive a confirmation email when your order ships. If you have received a confirmation email and you haven't received the order within expected transit times, contact us and we will track the package for you. Your credit card will be charged at the time your order is shipped. You should keep the order confirmation details displayed at checkout as well as the email confirming your order has been processed. We will send you another email to notify you when we've shipped your order and your credit card has been charged. A registered user only has to enter their address once. We save your order details and checkout details so you can look up previous purchases or purchase again without entering billing or shipping information. Our registered users may receive promotional emails with limited time offers of our product on fbeyewear.com. Please see our Terms and Conditions and Privacy Statement for complete disclosure of content distribution policies. To cancel a recent order, simply click on track order and click «cancel order». To change your order or update billing or shipping details, call 800 223 7610 as soon as possible. We will do our best to accommodate your request. Please keep in mind if the product has shipped, we cannot cancel or change the order. We accept Visa, Mastercard and American Express. The gateway provider we use is PayPal. There are two options to charge your credit cards. First, you may enter credit card information directly on our site. We take standard security measures using Secure Socket Layer (SSL) encryption for every transaction from our e-commerce server and your computer. Second, you may login to your PayPal account and proceed according to the PayPal user agreement. For your convenience, your credit card information can be stored in your fbeyewear.com account. This is secure information and cannot be accessed by anyone other than the account holder. For more information, see our Privacy Statement. For added security, your billing address at fbeyewear.com must exactly match the address on file at your credit card company. The processing of your order may be delayed if these addresses are different. We collect and remit sales taxes as required by law. International orders may have additional taxes and duties. Merchandise purchased at full retail price and returned within 30 days from the ship date on your invoice will be credited in the original tender, subject to withholding original shipping costs. Items must be in like-new condition to be accepted as a return. Contact our Customer Service team and we will email you a shipping label and return/exchange form. Fill out the form and include it in your return package. If paying for return postage yourself, we suggest you insure the package, and purchase tracking services for your protection. Save the shipping receipt for your records. Only merchandise received by our warehouse can be credited. For an exchange, specify the exchange item and the new color or size on the return/exchange form. Exchange requests must be made within 30 days of order receipt for merchandise purchased at full retail price. Returned items for exchange will be credited to the original form of payment and a new order will be placed for replacement item(s). Availability of replacement item is not guaranteed. You will receive an e-mail notification upon the completion of exchange processing. Welcome to www.fbeyewear.com (the "Site"). Fabien Baron Eyewear provides this Site and related services subject to the following terms and conditions of use (the "Site Terms"). By accessing, browsing or using this Site you agree to follow and be bound by these Site Terms and all applicable law. We have adopted a Privacy Statement that you should refer to in order to fully understand how we collect and use your information. The Privacy Statement is a part of these Site Terms. When you visit this Site, or send us e-mails, you are communicating with us electronically. You consent to receive communications from us electronically. We will communicate with you by e-mail or by posting notices on this Site. You agree that all agreements, notices, disclosures and other communications that we provide to you electronically satisfy any legal requirement that such communication would in any other form of writing. Images of people, places and/or products posted on this Site are either the property of Fabien Baron Eyewear, or are used herein with express permission to Fabien Baron Eyewear. Unless otherwise noted, all content included on this Site, including images, illustrations, designs, icons, photographs, video clips and written and other materials is the property of Fabien Baron Eyewear or its content suppliers and is protected by United States and international copyright laws. The compilation of this Site is the exclusive property of Fabien Baron Eyewear and is protected by United States and international copyright laws. Any unauthorized use of any content or materials on this Site is strictly prohibited and may violate copyright and trademark laws, and/or the laws of privacy, publicity, and/or communications regulations and statutes. Any use of the materials or content on this Site can only be made with the prior written and express authorization of Fabien Baron Eyewear. For further information on how you may obtain authorization to use any materials or content on this Site, please contact Fabien Baron Eyewear at information provided below. All trademarks, trade dress and service marks and their respective designs and/or logos on this Site are trademarks or registered trademarks of Fabien Baron Eyewear or its affiliates. Fabien Baron Eyewear and its affiliates' trademarks and/or trade dress may not be copied, imitated or used, in whole or in part, without the prior written permission of Fabien Baron Eyewear. In addition, all page headers, custom graphics, button icons, and scripts are trademarks and/or trade dress of Fabien Baron Eyewear, and may not be copied, imitated, or used, in whole or in part, without the prior written permission of Fabien Baron Eyewear. All other trademarks, registered trademarks, product names and company names or logos used on this Site are the property of their respective owners. You may not use any trademarks, trade dress, service marks or intellectual property of Fabien Baron Eyewear or its affiliates, nor may you place any meta tags or any other "hidden text" utilizing Fabien Baron Eyewear's or its affiliates' names, trademarks, or product names without our express written consent. (f) use of any data mining, bots, spiders, automated tools or similar data gathering and extraction methods, directly or indirectly, on the contents of the Site or to collect any information from this Site or any other user of this Site. If you use this Site and such use requires setting up an account and/or password(s), you are solely responsible for maintaining the confidentiality of your account and password(s) and for restricting access to your computer, and you agree to accept responsibility for all activities that occur under your account or password. If you register on the Site, you agree that any information you provide to us will be current, accurate and complete. Fabien Baron Eyewear will not be liable for any loss that you may incur as a result of someone else using your password or account, either with or without your knowledge. However, you could be held liable for losses incurred by Fabien Baron Eyewear or another party due to someone else using your account and/or password either with or without your knowledge. You agree to notify Fabien Baron Eyewear immediately of any unauthorized use of your account and/or password(s), or other breach of security. We reserve the right to refuse service, terminate accounts, remove or edit content, or cancel orders in our sole discretion. The prices displayed on the Site are quoted in U.S. dollars. Price and availability of products is subject to change without notice. Fabien Baron Eyewear reserves the right to limit the quantity of items purchased and/or to prohibit the sales to dealers. The technical specifications and settings of your computer may affect the accuracy of the display of colors of the products offered on the Site. THIS SITE INCLUDING CONTENT IS PROVIDED ON AN "AS IS" BASIS WITHOUT WARRANTIES OF ANY KIND (EXPRESSED OR IMPLIED) BY FABIEN BARON EYEWEAR. FABIEN BARON EYEWEAR DISCLAIMS WARRANTIES OF ANY KIND (EXPRESSED OR IMPLIED). Fabien Baron Eyewear makes no representations or warranties that this Site including content is free of errors. Fabien Baron Eyewear is not responsible for errors or omissions relating to pricing, text, or any other content on this Site. Fabien Baron Eyewear makes no warranties that the Site, its server(s) or e-mails sent from the Site are free of harmful components or viruses even if Fabien Baron Eyewear has been advised of possible damages arising. 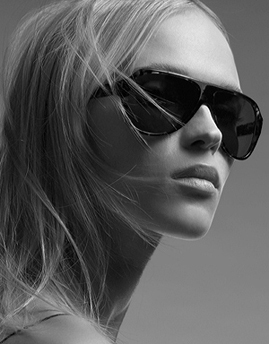 Fabien Baron Eyewear does not guarantee the continuous, uninterrupted and secure access to the Site as the operations of the Site may be interfered with by numerous factors outside the control of Fabien Baron Eyewear. Use of this Site is at your own risk. WE DISCLAIM ANY AND ALL WARRANTIES OF ANY KIND, WHETHER EXPRESS OR IMPLIED, TO THE FULLEST EXTENT PERMISSIBLE UNDER APPLICABLE LAW IN RELATION TO THE PRODUCTS AND SERVICES AVAILABLE THROUGH THIS SITE INCLUDING, BUT NOT LIMITED TO, IMPLIED WARRANTIES OF SATISFACTORY QUALITY, MERCHANTABILITY, FITNESS FOR A PARTICULAR PURPOSE, TITLE, AND NON-INFRINGEMENT AND IMPLIED WARRANTIES ARISING FROM COURSE OF DEALING OR COURSE OF PERFORMANCE. We expressly disclaim all liability for product defect or failure claims that are due to regular wear, product misuse, abuse, modification or improper product selection. IN NO EVENT WILL WE OR OUR AFFILIATES BE LIABLE FOR ANY DAMAGES OF ANY KIND ARISING FROM THE USE OF THIS SITE OR THE PRODUCTS OR SERVICES OFFERED ON OR SOLD THROUGH THIS SITE, INCLUDING INDIRECT, SPECIAL, PUNITIVE, INCIDENTAL, EXEMPLARY OR CONSEQUENTIAL DAMAGES, EVEN IF PREVIOUSLY ADVISED OF THE POSSIBILITY OF SUCH DAMAGES. SOME STATES DO NOT ALLOW CERTAIN LIMITATIONS ON IMPLIED WARRANTIES OR DAMAGES; THEREFORE SOME OF THESE LIMITATIONS OR EXCLUSIONS MAY NOT APPLY TO YOU. By accessing, browsing or using this Site, you agree that the laws of the State of New York, without regard to principles of conflict of laws, will govern these Site Terms and any dispute of any sort that might arise between you and Fabien Baron Eyewear or its affiliates. Regardless of where you access this Site, you agree that any action at law or in equity arising out of or relating to these Site Terms, the Privacy Statement (except disputes arising out of or relating to our adherence to the EU Directive and Safe Harbor Principles which must be submitted to arbitration as described in the Privacy Statement) or any product or service offered or purchased on or sold through this Site shall be filed and adjudicated only in the federal or state courts located in the City of New York, and you hereby irrevocably and unconditionally consent and submit to the exclusive jurisdiction and venue of such courts over any suit, action or proceeding between you and Fabien Baron Eyewear or any of its affiliates. These Site Terms constitute the entire agreement between the user and Fabien Baron Eyewear with respect to this Site and supersede all prior or contemporaneous communications and proposals, whether electronic, oral or written with respect to this Site. A printed version of these Site Terms and of any notice given in electronic form shall be admissible in judicial or administrative proceedings based upon or relating to these Site Terms to the same extent and subject to the same conditions as other business documents and records originally generated and maintained in printed form. Any rights not expressly granted herein are reserved. This Privacy Statement describes the types of information we collect from you when you visit or order products from our Site, and explains how we use this information. The Privacy Statement applies only to this Site. By accessing and using this Site, you agree to be bound by this Privacy Statement effective as of December 11, 2007 and remaining in effect until replaced. 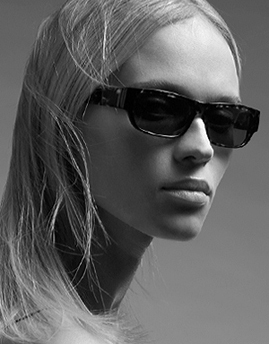 Fabien Baron Eyewear respects your privacy. Any personal information we collect is used for the purpose of serving you better. Collected information allows us to better understand your product and service preferences. Fabien Baron Eyewear may collect two types of information: "Personal Information" (personally identifiable such as name, address, phone number, credit card number etc.) and "Aggregate Information" (non-personally identifiable information such as number of customer visits to this Site). If you purchase a product or service from us, we request certain identifiable (personally or corporately) information from you on our order form or from users at several points on this Site. You must provide contact information (including, but not limited to, name, email, and shipping address) and financial information (which may include, but is not limited to, credit card number, expiration date, etc.). We use this information for billing purposes and to fill your orders. If we have trouble processing an order, we will use this information to contact you. Fabien Baron Eyewear is the sole owner of the information collected on www.fbeyewear.com. From time to time we may provide you the opportunity to participate in surveys on our Site. If you participate, we will request certain Personal Information from you. Participation in these surveys is completely voluntary and you therefore have a choice whether or not to disclose this information. The requested information typically includes demographic information (such as income level and gender). We use this information to monitor the interests and attitudes of visitors to our Site and to ensure that our Site provides information that is relevant and helpful. Based upon the Personal Information you provide us, we will communicate with you in response to your inquiries, to provide the services you request, and to manage your account. We will communicate with you by email or telephone, in accordance with your wishes. If you choose to order a product from us through this Site, we will occasionally send you information on products, services, special deals and promotions. You may, however, choose not to receive these types of communications at the time of your order. If, at first, you agree to receive this information but decide that you do not want to receive it any longer, please email info@fbeyewear.com and request to opt-out of receiving information from Fabien Baron Eyewear. We share aggregated demographic information about our user base with our agents, including agencies or third-party vendors used to aggregate demographic information, provide marketing analysis and consult on advertising strategies. This information does not identify individual users. We do not link aggregate user data with Personal Information. We use an outside shipping company to fulfill orders, and credit card processing software to bill you for goods and services. These companies do not retain, share, store or use Personal Information for any other purposes. We will also share information with third parties who assist in aggregating data relating to the purchase of goods from our Site, the redemption of special website offers and promotions, and other similar transactions in order to analyze trends and improve our marketing efforts. Although the information shared with these third parties necessarily contains Personal Information, such Personal Information is not present in the reports they generate. In order to provide secure and convenient online ordering, we use third-party vendors to verify your credit card information and billing address. You may ask us for Personal Information retained about you. If your Personal Information changes, or if you so request, you may have us correct, update, amend or delete that information. You may also request that the information not be disclosed to any third party. Please address your requests to the mailing address provided below. All Personal Information will be used only for the purposes described in this Privacy Statement. The security of your Personal Information is important to us. When you enter sensitive information (such as credit card number) on our registration or order forms, we encrypt that information using secure socket layer technology (SSL). We follow generally accepted industry standards to protect the personal information submitted to us, both during transmission and once we receive it. No method of transmission over the Internet, or method of electronic storage, is 100% secure, however. Therefore, while we strive to use commercially acceptable means to protect your personal information, we cannot guarantee its absolute security. If you have any questions about security on our Site, you can email us at info@fbeyewear.com. fbeyewear.com participates in the Safe Harbor program developed by the European Union and the U.S. Department of Commerce to permit U.S. organizations to comply with the European Union's Directive on Data Protection. We adhere to the Safe Harbor Principles. To obtain further information about the SafeHarbor program and to view our certification of adherence to the Principles visit the U.S. Department of Commerce Safe Harbor Web site: http://www.export.gov/safeharbor/SafeHarborInfo.htm. If you would like to contact fbeyewear.com directly about the Safe Harbor program, please e-mail us at info@fbeyewear.com. Any dispute arising out of the or relating to our adherence to the Directive and the Principles will be submitted for binding resolution at an arbitration conducted and administered in accordance with the applicable rules of the American Arbitration Association. The arbitration will be held in New York, NY and will apply New York law (without regard to its conflict of laws principles) and the Principles. A force in fashion and design for decades, creative director and designer Fabien Baron has now turned his elegant sensibility to eyewear. "Today, sunglasses have become one of the most important fashion statements," he says, "but there has been a lack of classic, discreet design. As objects, sunglasses have always been interesting to me. I have worked three-dimensional before"-most notably by creating such objects as the CK One and Eau D'issey Frangrance bottles and a line of sleek furniture for Cappellini. Working meticulously to perfect the fit, millimeter by millimeter, and sourcing only premium materials, Baron has created a luxe collection that is as comfortable and chic as it is durable. “I wanted to put the real work into the design and the quality, not the logo,” he says. Handcrafted in Japan, both the metal and acetate frames correspond to the most rigorous quality standards, the high density acetates are carved into shape rather than molded, and the metal frames are cut from single sheets instead of constructed from wire, with no welding. Polarized lenses are scratch-resistant and state of the art, reducing filter glare, UV rays and reflections. 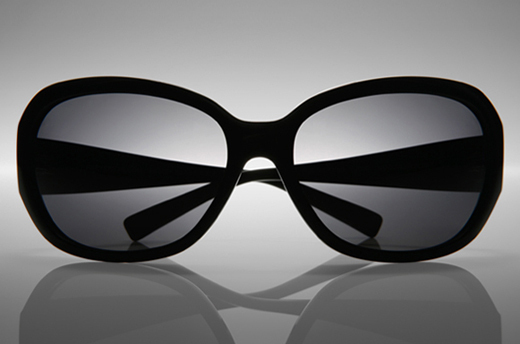 The result is sunglasses that combine lightness of form with functional strength. Baron's shapes are modern interpretations of the classics for men and women, with unisex models offered in smaller and larger sizes to flatter every face. The only visible “label” as such is a smaller plaque hidden above the temple. And with Baron's signature attention to detail, all models come in a natural suede pouch and a highly polished black acrylic case. “This is a collection that is bold in its simplicity,” says Baron.